The National Institute for Health and Care Excellence (NICE) has issued draft guidance recommending the dexamethasone intravitreal implant for the treatment of diabetic macular oedema (DMO). 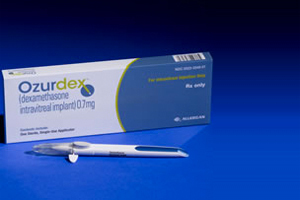 The preliminary recommendations cite the implant, marketed by Allergan as Ozurdex, as a treatment option in patients where the implant is to be used in an eye with an intraocular (pseudophakic) lens, or if their DMO does not respond to non-corticosteroid treatment. It is additionally recommended if the latter aforementioned treatment is an unsuitable treatment option for the patient. Dr Carole Longson, health technology evaluation centre director at NICE, commented: “NICE is pleased to five the green light to dexamethasone intravitreal implant for some people with diabetic macular oedema in preliminary recommendations. The cost of a 700-microgram implant and applicator is £870, with one implant administered every six months in the affected eye and up to seven implants may be given. Ozurdex is injected into the eye once every six months and works by suppressing inflammation and preventing oedema forming in the eye. This reduces leaking from blood vessels and restrains the release of inflammatory compounds that cause damage to the eye. The eye indication was approved for DMO in the EU in September of last year, setting it up as competition against Novartis' blockbuster eye drug Lucentis (ranibizumab) as well as Bayer'd Eylea (aflibercept), which both have licences for DMO.